There are jobs we love and jobs we hate. A fridge clean out isn’t a huge amount of fun, but once it’s done it is just so satisfying! 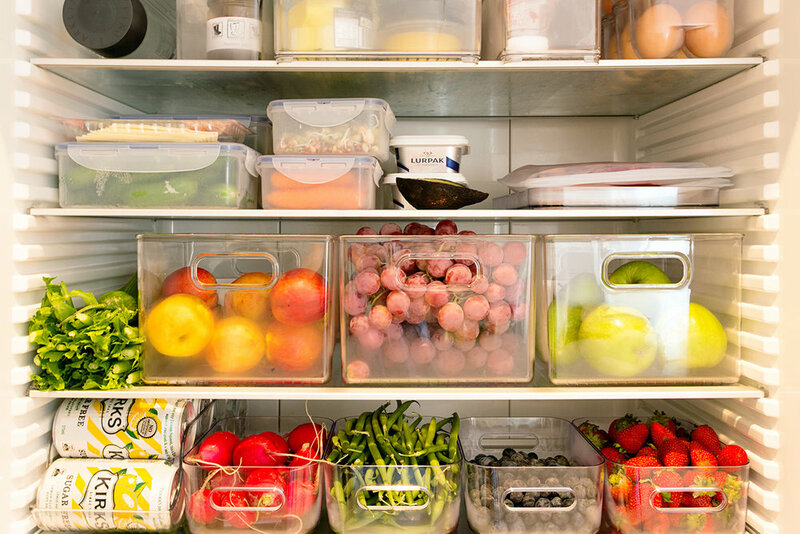 Not only does a clean and organised fridge look great, it is also beneficial to your health. You are less likely to get sick from a sanitised fridge so giving it a good deep clean every season is a must, with a few good wipe downs in between. Empty that fridge out and I mean everything! from top shelf to the crisper drawers, a clean out wont take too long but if you are worried about perishables, fill your sink with ice and let them sit in there staying cool. Wipe that fridge out and I mean everywhere. In every corner, in every groove and every shelf. Take out your crisper drawers and soak then wash them in soapy hot water before returning them. Organise your fridge properly this is something you need to keep a weekly check on but setting it up in an organised fashion is easy. 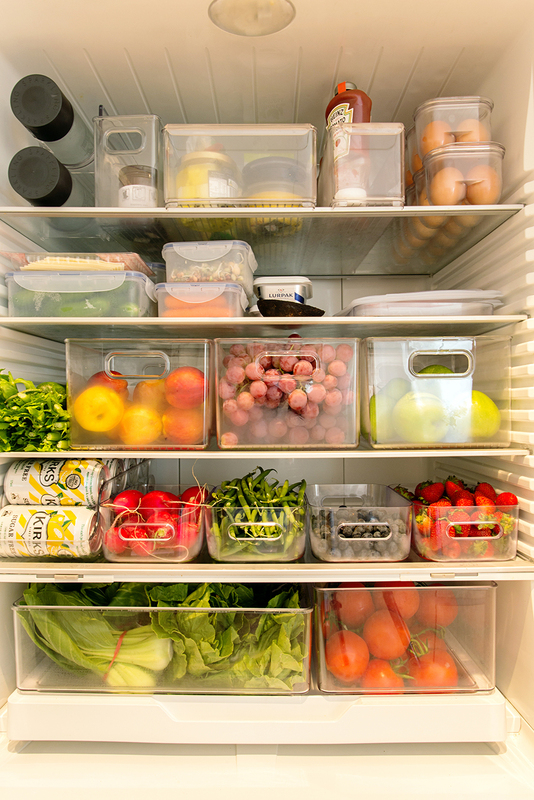 Containers are a godsend when it comes to fridge storage and there is nothing that makes me feel more organised than looking in at a fridge full of neatly stacked order. When organising your fridge think about what parts of the fridge are the coldest… Imagine your fridge is like a thermometer with the coldest part at the bottom and the warmest part is at the top, so when you return your food place them accordingly. Milk always tends to be placed on the top shelf when it needs to stay coldest at the bottom along with yoghurts and creams. DO I BELONG IN THE FRIDGE? Apples, pears, and many other fruits are kept in cold storage after they are harvested, so keeping them in the fridge after buying them will help them keep longer. Fruits like pears, peaches, and other fruits that are sold when they are under ripe should be removed from the fridge a day or two before eating, to allow them to ripen a bit more. Berries should be unwashed and refrigerated, and only washed right before using them. Only a few fruits and vegetables are hurt by being refrigerated. Bananas will turn brown, and tomatoes lose flavour - so keep those gorgeous red tomatoes out on display to keep their flavour. It is of the utmost important to store meat safely in the fridge to stop bacteria from spreading and avoid food poisoning. Food can look and smell fine even after its "use by" date but that doesn't mean it's safe to eat and even storing leftovers comes with it’s own cons. Cool down leftovers as quickly as possible (within two hours), store them in the fridge and eat them within two days - if not eaten, throw them in the bin! We all need to be very careful when it comes to reading use by dates and how we store our leftovers to avoid sickness. A shining fridge is something that excites me! A solution of one part vinegar and three parts water is all you need to pour onto a cloth to clean the shelves and drawers of your fridge. For areas that are a little trickier, let the solution soak the area to make it easier to scrub off. For stainless steel make sure you wipe in the direction of the grain then use a clean, dry cloth to buff.